The C-Class Cabriolet opens a new era of driving enjoyment and sporty elegance. Its convertible top is woven not just from rich fabric but a legacy of innovation, athleticism and craftsmanship that never goes out of style, or out of season. Open-air style brings out the muscular lines and seductive cabin of the C-Class. In under 20-seconds, one button summons the 3-layer acoustic soft top from it’s elegantly covered recess,to envelop you in quiet, coupelike comfort. © 2018 Mercedes-Benz Canada Inc. 2017 C 300 4MATIC Cabriolet with optional Premium Package ($3,400), Sport Package ($2,000), Active LED High Performance Lighting System ($350) and 19” AMG Wheels ($500) shown above, Total Price $60,490. **Lease and finance offers for the 2018 C-Class Cabriolet (excluding AMG) available only through Mercedes-Benz Financial Services on approved credit. **Lease offer only available through Mercedes-Benz Financial Services on approved credit for a limited time. Lease APR of 3.9% applies up to 45 months. Finance APR of 2.9% applies up to 60 months. Freight/PDI of $2,695 ($3,495 for AMG models), dealer documentation fee of $595, air-conditioning levy of $100, EHF tires, filters, batteries of $25, and PPSA of $39.30 are due at signing. MSRP starting at $48,100. Cash Credit of $1,750 is only applicable on the 2018 C 300 4MATIC Cabriolet for lease and finance programs through Mercedes-Benz Financial Services. This is a one-time credit for deals closed before May 31, 2018. 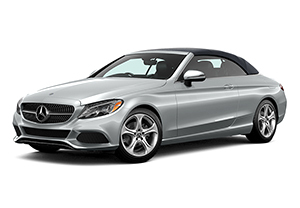 First, second and third month payment waivers are capped for the 2018 C 300 4MATIC Cabriolet up to a total of $450 (including taxes) for lease programs and up to a total of $650 (including taxes) for finance programs. The loyalty program offers a 1% rate reduction off of the lowest posted lease (minimum lease rate is 0.00%), retail finance or star advantage rate on new and demonstrator Mercedes-Benz passenger car vehicles (minimum finance rate is 0.00%). To be eligible, a customer must have leased or financed a new or pre-owned Mercedes-Benz with Mercedes-Benz Financial Services and currently have an active account or had an active account within the last 6 months. Certain limitations apply. Vehicle license, insurance, registration, and taxes are extra. Dealer may lease or finance for less. Offers may change without notice and cannot be combined with any other offers. See Mercedes-Benz Surrey for details or call (604) 581-7662. Offer ends May 31, 2018.